1. Find assigned seats. I ALWAYS assign seats and have tried several different systems. 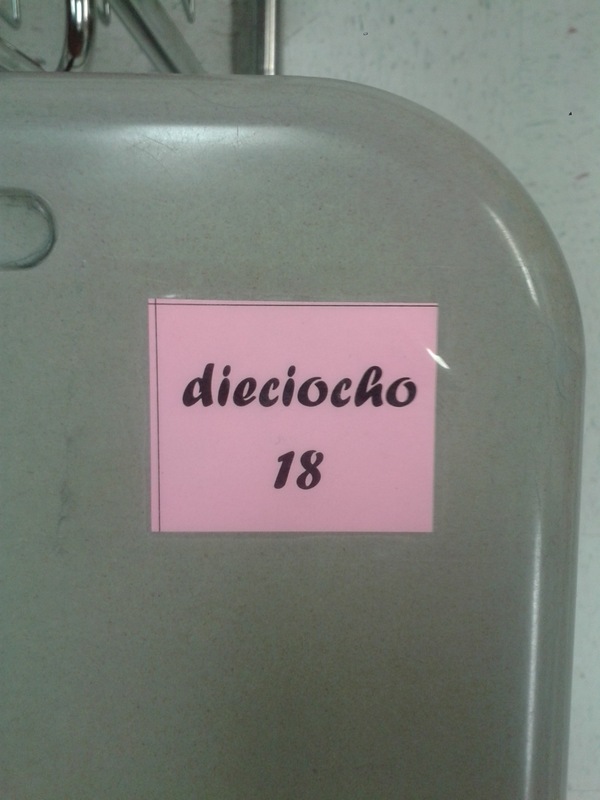 This semester I added numbers to my desks and to my seating chart and it went soooo much better – no one sitting in the wrong seat! I stood in the doorway and greeted each student, asked their name in Spanish, and told them their number in Spanish. Bonus: taking role is a breeze – just see which desks are empty! I had to use the restroom between first and second period so I locked the kids out until I came back. I wanted to be there when they first entered my room to greet them and tell them where to sit! I think everyone is more comfortable when they have an assigned seat from the start rather than sitting somewhere and then being moved later. 2. Name cards. This helps me learn names and is also an easy way to start out class in Spanish. Levanta la tarjeta. Baja la tarjeta. Levanta el marcador. Baja el marcador. Levanta el marcador y la tarjeta. Baja la tarjeta. Baja el marcador. Levanten los marcadores rojos…. I’m super positive and encouraging throughout the activity and it sets a great tone for the class. 3. Interest inventory – I copied this from one I saw posted on the Creative Language Class. I take them up as students finish and read them right away – if I don’t read them in class, they often don’t get read. I like to focus in on their responses to what do you think you’ll make in this class?, what do you want to learn in this class? and anything else I need to know? IEPs and 504s don’t always make it to me in time, and I really want to know from the first day of class if a student is diabetic or pregnant. I like What do you think you’ll make in this class? so that I know from the beginning which students I need to focus more attention on (they usually answer honestly!). In Spanish 2, I added the question, Are you interested in taking Spanish 3? so that I can make sure that those students know the grade requirements for taking Spanish 3, and also so I can provide a few extra grammar explanations/activities for them to make sure that they are successful with the Spanish 3 teacher. 3. Syllabus – I’m on an 80 minute block, there’s plenty of time to do this and CI too. You shall not pass Spanish 2 if you can’t respond when I ask you ¿Cómo estás? This is the part that I really messed up last semester. I took some resources my department gave me – a long list of verbs and some conjugation worksheets – and ran with it. It was awful. Too many words, too much decontextualized grammar, too much explanation, too much output and not enough input. Grades were predictably bad. The year before I had taught all Spanish 1s, and before that I was my own department and did what I wanted (and knew exactly what every single one of my Spanish 2 students could do in Spanish). With one semester of Spanish 2 with department curriculum behind me, I know what students need to learn to pass the county final exam, and I feel more confident to tailor my classes to my students’ needs, interests and abilities, while still hitting department requirements. The grammar we can review more slowly as we go along, and all those verbs? Not necessary (all that cramming didn’t help anyway). I have a much better idea of what they need to pass the final, and it’s not as much as what I did last semester. I can relax on some of the grammar (while making sure Spanish 3-bound students have it down) and focus on providing more comprehensible input. Back to my lesson today: we copied a few basic phrases to support the goals listed above, and they ran through the questions and answers in Spanish with a partner. I started calling on students individually and asking them one of the questions – ¿Cómo estás? ¿Cuántos años tienes? ¿De dónde eres? When I got to ¿Qué te gusta hacer? it got a lot more interesting. Some students remembered words from Spanish 1 – Me gusta correr. Me gusta nadar. Some didn’t, and I helped them. I gestured and reviewed vocabulary as we went along, and found out what sport everyone played. It was fun! I expanded on answers where I could and told them my opinion on everything, gesturing for comprehensibility – No me gusta correr. ¡Me gusta comer! Me gusta cocinar y comer. No me gusta practicar deportes, pero me gusta hacer ejercicio. Me gusta caminar con mi perro y levantar pesas y bailar en mi clase de Zumba! No me gusta estudiar, pero estudio mucho para mi clase de internet… When I finished calling on everyone, I pulled up my “activity” vocab list on Quizlet – the verbs we actually learned and used last year. I went through each one with both Spanish and English showing (Spanish and a picture would have been better, but Spanish-English was what I had), and asked who liked each activity, continuing to circle and expand on answers. 5. 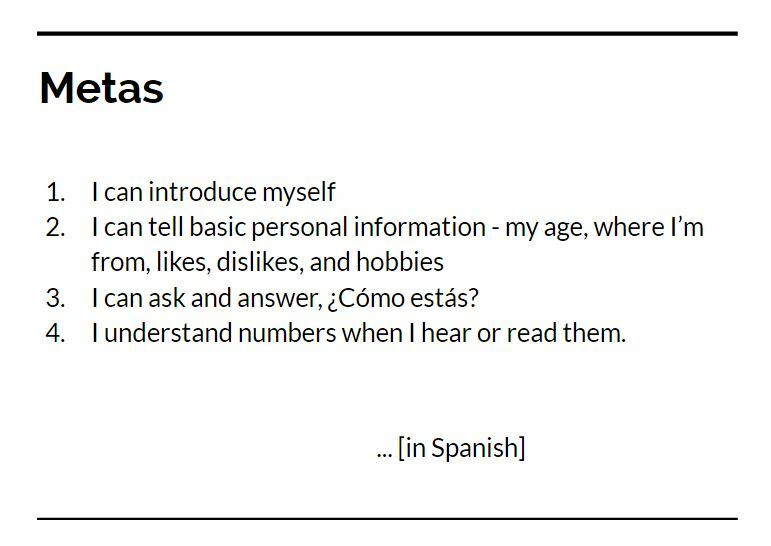 La estrella de la semana – I know many teachers do “persona especial” interviews, but I really like how Kara explains her procedures. I had students fill out the handout she has linked in her post, and told them that we would be doing interviews throughout the semester, kind of like the discussion about likes and dislikes we had just had. 6. Closing – numbers review. With a few minutes left of class and most students done with their handouts, I needed something quick to fill the time. I pulled up Quizlet, froze the screen, and clicked through the numbers flashcards with the audio on, with students telling me the meaning in English. We did the same thing looking at the words spelled out. I was very pleased with the amount of Spanish I was able to speak today, as well as the focus of our review, and the positive start. Hoping for my best Spanish 2s yet! This entry was posted in Class Activities and tagged comprehensible input, First Days, Review, Spanish 2. Bookmark the permalink.